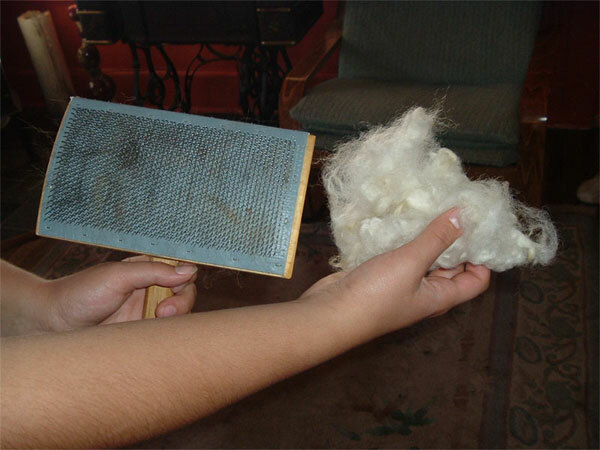 In part one of Preparing Wool for Yarn we learned how to shear sheep and get the wool cleaned and ready to card. Now we will turn it into yarn! Now the wool is ready to be carded! 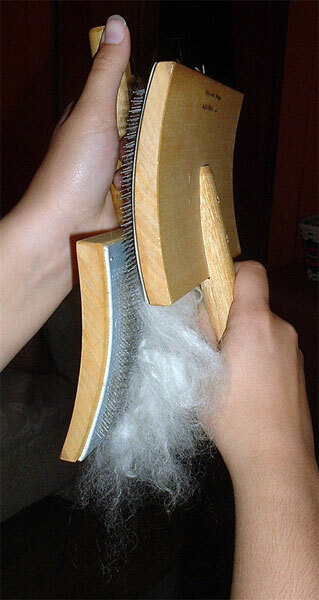 Carding is simply combing the fibers to separate and straighten so that they are easier to spin into yarn. To card my wool I use Strauch brand wool hand carders . 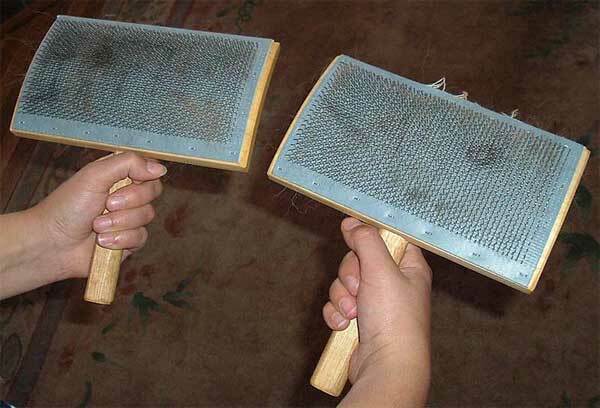 a pair of wooden paddles with wire bristles (see picture 1). 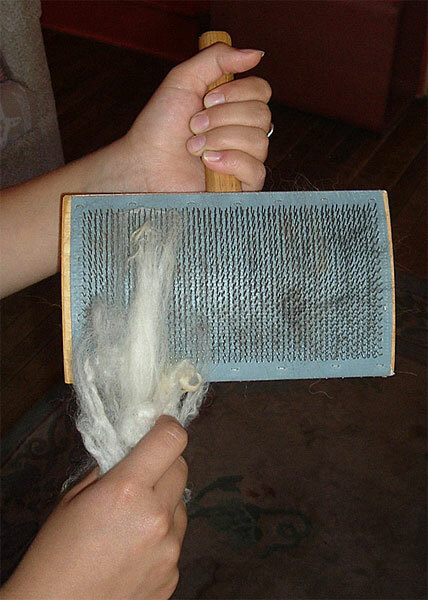 I take a handful of fleece and catch it on the metal bristles of the left carder, filling the carder until I can barely see the bristles (see pictures 2-4). I then take both carders in hand and pull them together by matching up the bottoms and slide them across each other (see pictures 5-6). 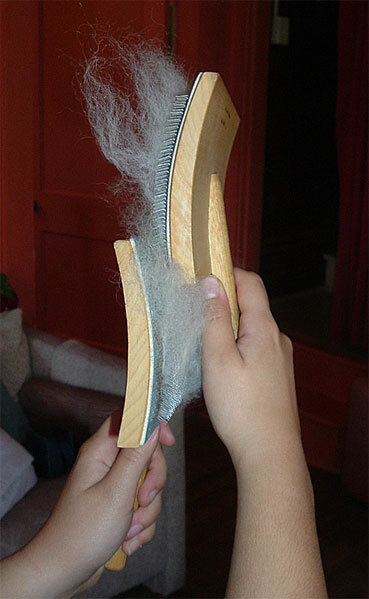 The teeth on each carder are slightly kinked so that when the carders come together in the opposite way, the bristles pull the fibers of wool to untangle them . 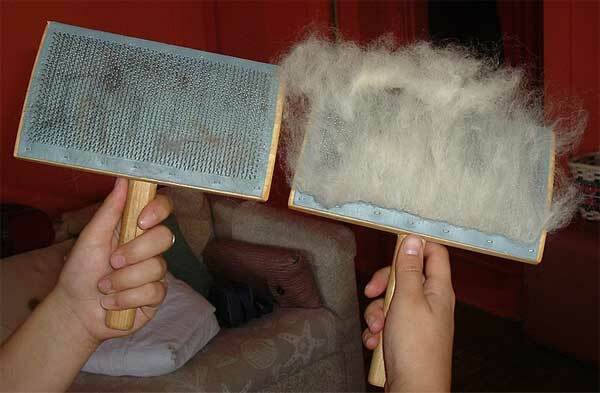 just like brushing your hair! I continue in this way until the wool is smooth and there are no clumps or balls of wool. I then match the bottom of the right carder to the top of left carder and slide the right carder down so that all the wool is now on the right carder (see pictures 7-9). 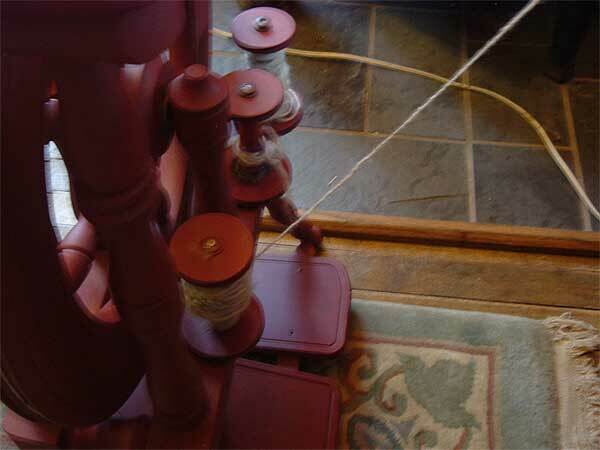 Next I roll the wool toward the handle and off the carder to make a rolag for spinning (see pictures 10-12). 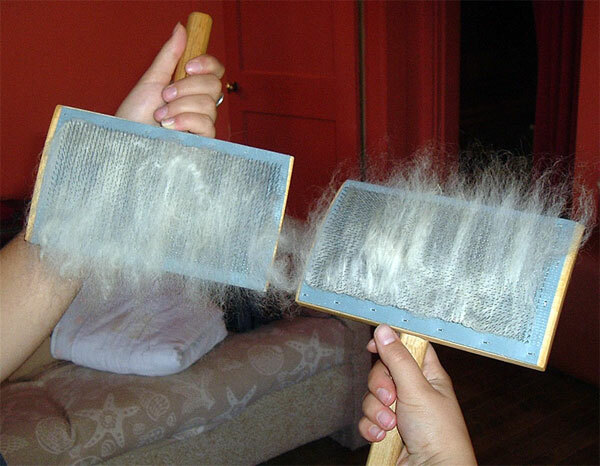 Note: There are many different kinds of hand carders, some with more fine bristles and less fine depending on how coarse the fiber is. 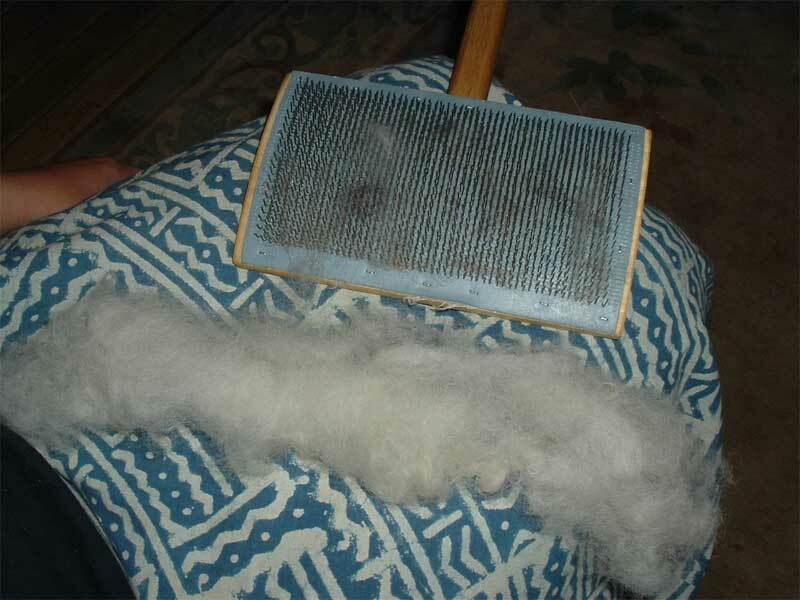 You can also use a drum carder which is a larger hand-cranked machine used for carding larger amounts of wool. Once I.ve carded about 1 lb. 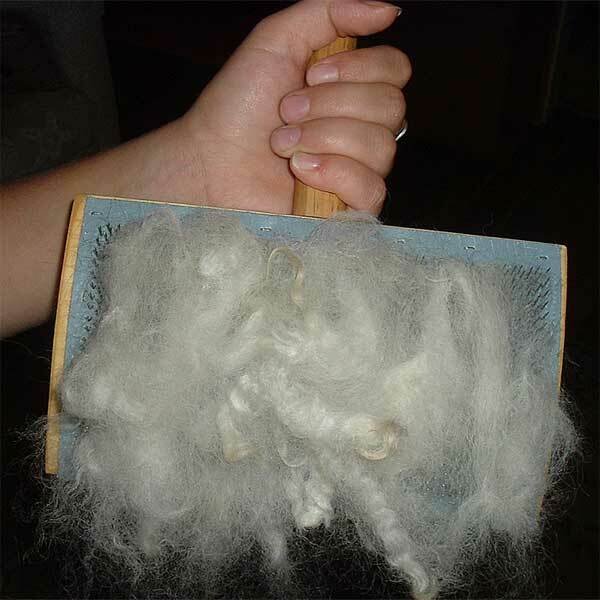 or more of fleece, I get ready to spin some yarn! 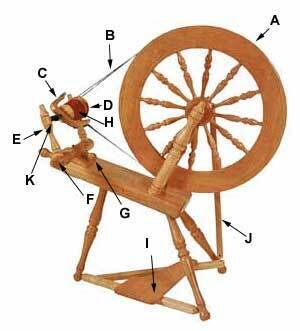 There are many different styles and brands of spinning wheels (Ashford, Louet, Jensen, Majacraft, etc.). I use an Ashford Traveler, which is a more a compact style and spins great! Spinning is something that takes time, practice, and muscle memory, so don.t be discouraged if you find that you don.t get it the first time or even the fiftieth time. Once you get it, it.ll be like riding a bike! Here.s some to vocab to read over and a diagram of the parts of a spinning wheel to review before beginning. 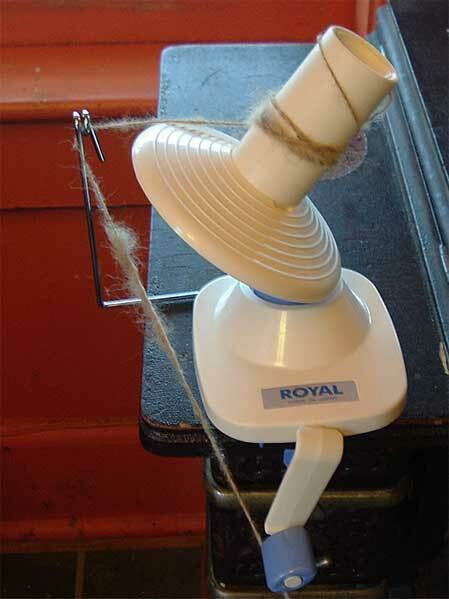 Drafting - Thinning fiber while spinning to make an even and consistent width yarn. 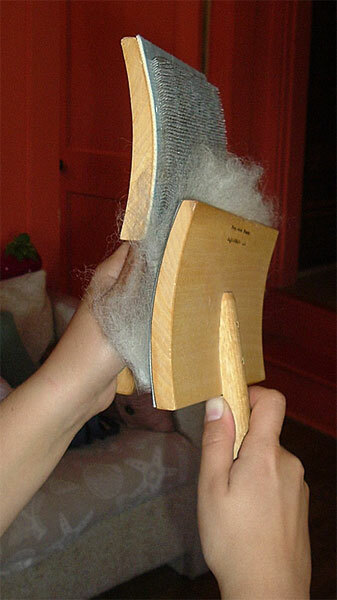 Pre-drafting - Drafting fiber before you begin spinning. If you are a beginning spinner, here are some simple instructions on how to spin and some demo videos to help you along. 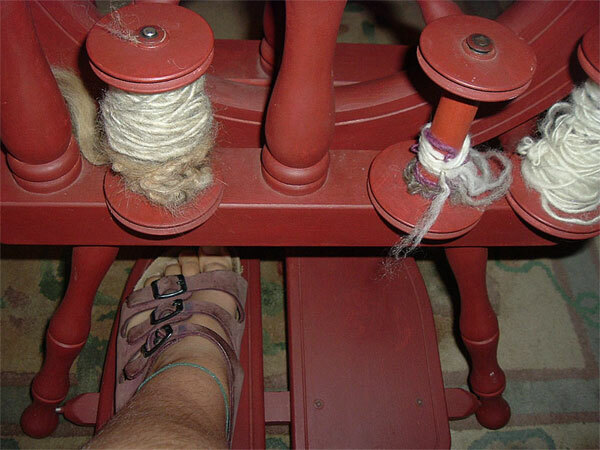 Begin by treadling with your feet for a few minutes, moving the fly wheel (the round wheel) clockwise (see picture 13). This will help you get the motion down and think less of your feet when you begin to work with your hands. Once you.ve got the motion down, tie a leader onto your empty bobbin. Thread the leader through the farthest hook from the front of the flyer and through the rest. Pull the leader through the orifice (see video 1). Note: The videos are a little small, I will try to get Wendy Mae to do some expert ones for me real soon! But, I think you can get the idea! 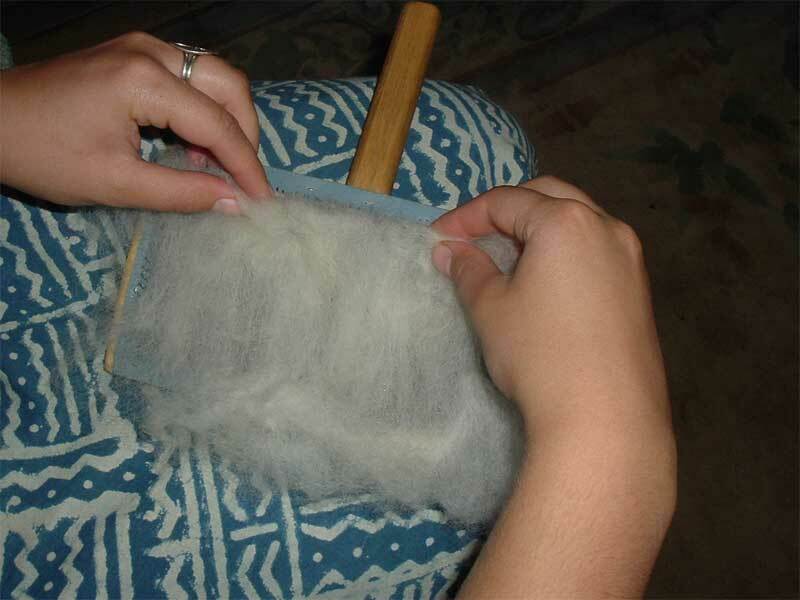 While this is an optional step, it often helps to pre-draft when your fiber is bulky or inconsistent in its width. When using roving, in particular, I often split it in half and then begin pre-drafting each piece (see video 2). 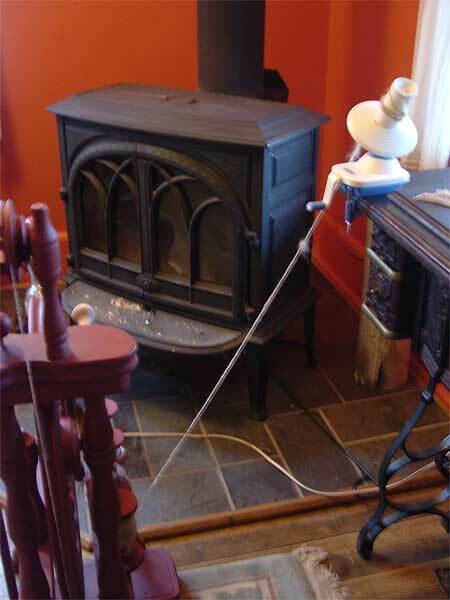 Now you are ready to draft the fiber onto the leader and spin some yarn! While holding your leader in your left hand and treadling, bring your fiber with your right hand and let it attach to the leader. Now draft out the fibers by continuing to hold the newly attached yarn with your left hand and pull the fiber with your right until the fiber loosens and thins out. Don.t pull too hard because the fiber will easily pull apart. If the fiber does pull apart, then draft it back on as you did with the leader. 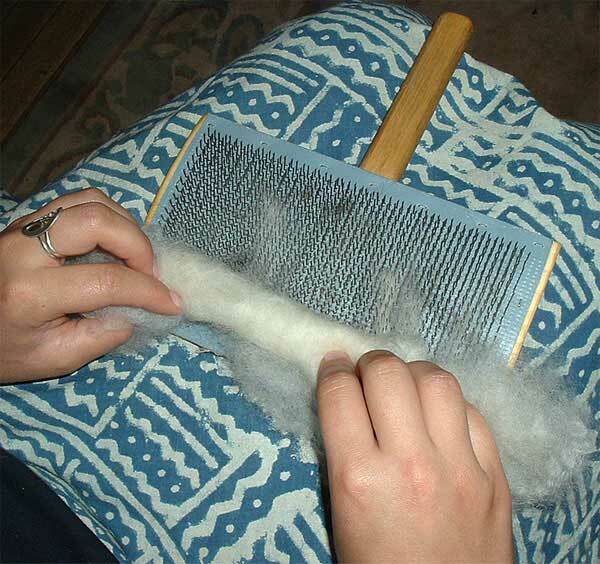 Slide your left hand down the drafted fibers so they begin to twist. Do not let the twist run past the area you drafted. Prevent this by placing your fingers at the end of the twisted portion. Feed the portion you have twisted onto the bobbin (see video 3). Adjust the tension as needed. If it seems like the twist is running down your fiber faster than you can draft it, then loosen the tension a bit (see picture 14). The tension string is attached to the bobbin. 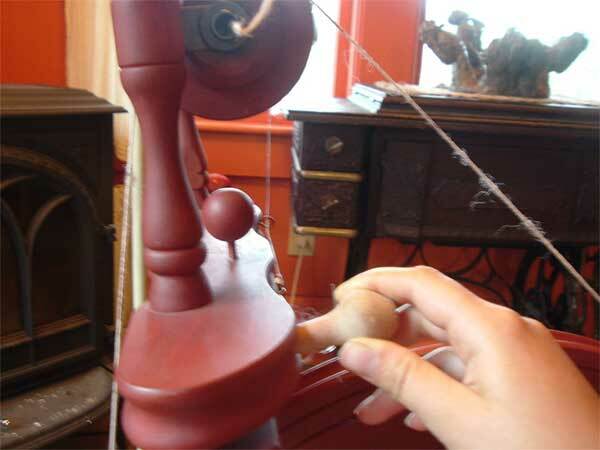 By tightening the tension, you are placing pressure on the bobbin, which will pull your yarn onto the bobbin faster. Continue in this way until the bobbin is full. When portions of the bobbin are full, bring your yarn to next hook on the flyer so the yarn is evenly wound on the bobbin. 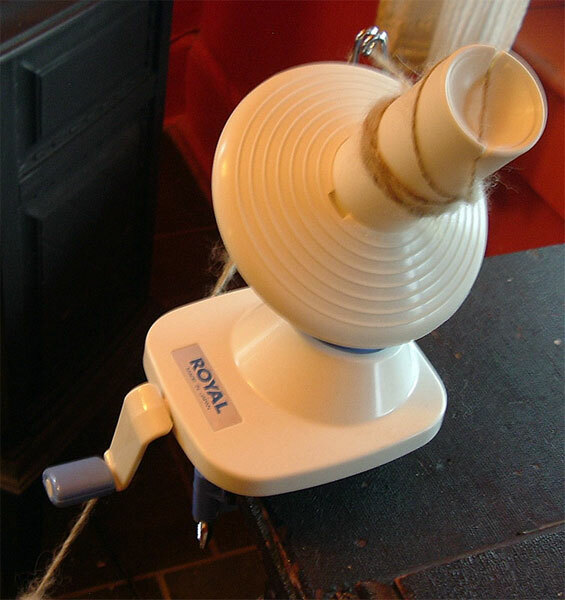 Once you have filled up your bobbin, you may wind it into ball by using a hand crank ball winder (see pictures 15-18) or by simply winding it yourself. You now have you very own ball of yarn to do with as you wish! Enjoy carding and spinning, I hope you enjoy it as much as I do!